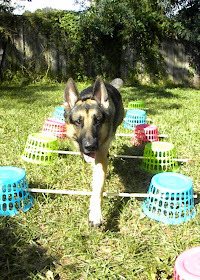 Jedi drags his rear feet. It's something that I'm hoping we can fix in Body Awareness and Targeting class. I had a friend suggest using cavaletti. They are small jumps used to strengthen muscles and adjust stride in horses. Apparently there are dog versions too. I was really excited until I saw how much they cost. The average price was $50 for a set of three, and everything I read said at least five cavaletti are needed to be effective. ugh. I found some plans on the internet to make your own cavaletti as well, but most of those required skills and tools that I just don't have. But then . . . I found these bright little baskets for $1 each. I bought a dozen. I had some 1/2" PVC left over from a home improvement project. I cut it into six 48" pieces. I bought a roll of fancy tape for $2 at Wal-Mart to decorate the PVC -- just because. Assembly is super easy: Run a PVC piece through the middle holes of two baskets to make hurdles a.k.a. cavaletti. (Use higher or lower holes to increase/decrease the difficulty level.) 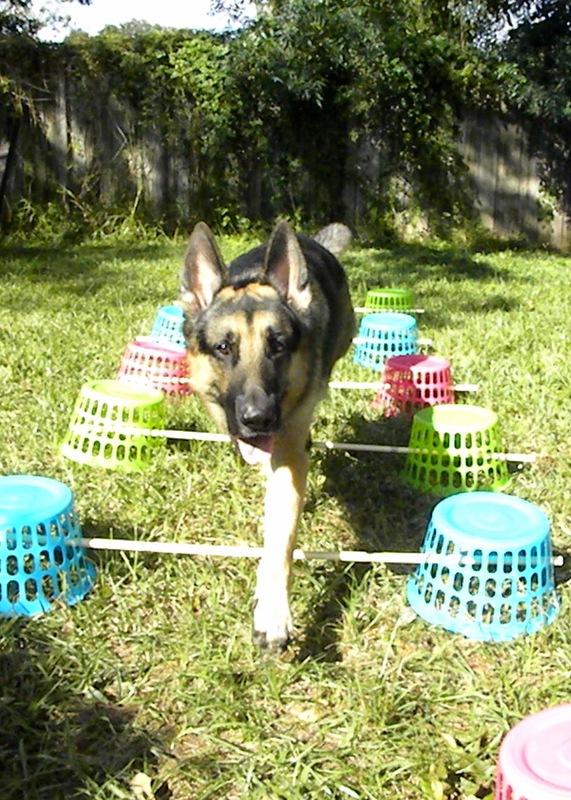 Spread the baskets far enough apart that your dog can walk through them comfortably. Cavaletti should be spaced shoulder height apart. I had an extra piece of PVC that I held up to Jedi and marked at the withers (the highest point behind the neck). I taped that spot and used the pole to measure the distance between cavaletti. Then I ran Jedi through. Did he knock them down? You betcha! The fifth and sixth one were knocked over every time. But it didn't scare him and he willingly ran through again and again. And when we were done everything disassembled easily and takes hardly any room to store. Score! P.S. Like the idea of going cheap? 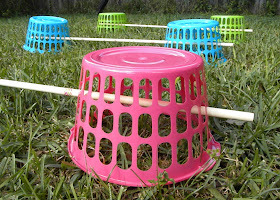 Check out my recycled perch and ghetto travel plank here.